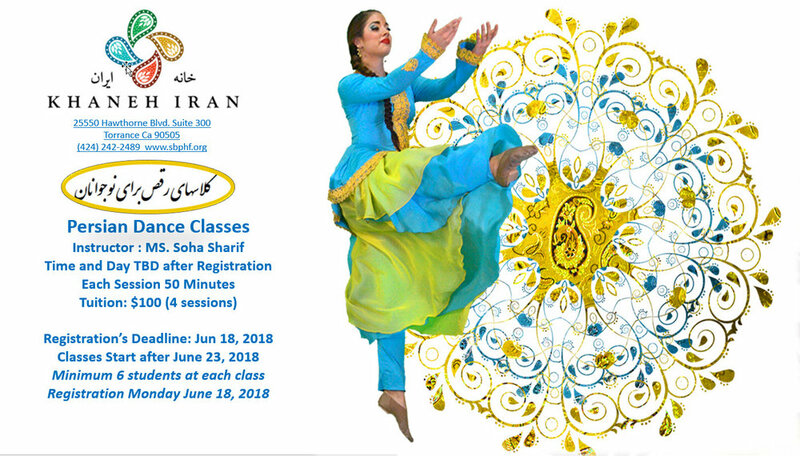 To register, please fill out our form below with the Class line: Dance Class, and pay your tuition online via our payment page or bring your payment to Khaneh Iran before our registration deadline, June 18th at 5 pm. If you are planning to pay online through our website, please go directly to our payment page and fill out the same form as below at the checkout to avoid redundancy. I hereby register (self/ or child)_____________________________________ in the Dance classes and activities sponsored and taught by SBPHF during the summer 2018. I understand that attendance to every class is mandatory each week. In case of absence, the instructor needs to be notified ahead of time. I understand Parents need to drop off and pick-up their children in a timely manner. I also acknowledge that SBPHF is a non-profit organization and that the classes established are for enrichment of the students in Persian language and culture. It is my responsibility to make sure that my child is physically escorted to and from the classes. SBPHF is not responsible for before or after class hours. I will drop of my children at the dance class on time.